In honor of World Book Day, we’re taking a look back at some amazing nail art looks inspired by great reads. During NAILS Next Top Nail Artist Season 1 competiton, the week 5 challenge asked nail techs to create a design inspired by the 1950s.In an effort to stray from the Greaser-vibe, Lexi Martone and Jane Moate looked to the bookshelf for inspiration. Martone paid homage to the Dr. Seuss classic, Cat in the Hat. For a step-by-step of this design, click here. 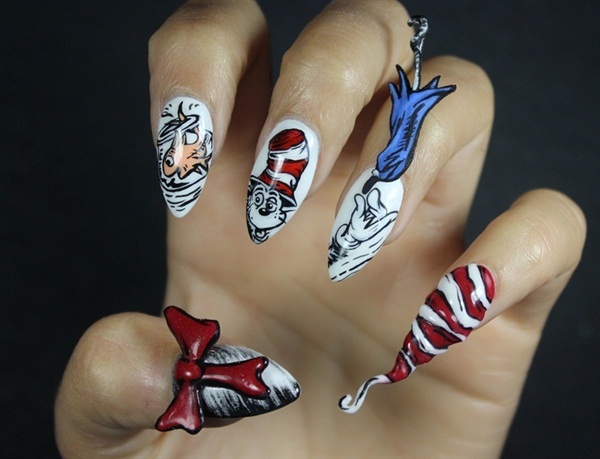 Moate handpainted several titles (including Cat in the Hat) for a bibliophile’s dream nail look. Click here for a full tutorial on this design. See more book-inspired nail art here. Have you ever executed book-inspired nails? Let us know in the comments below!